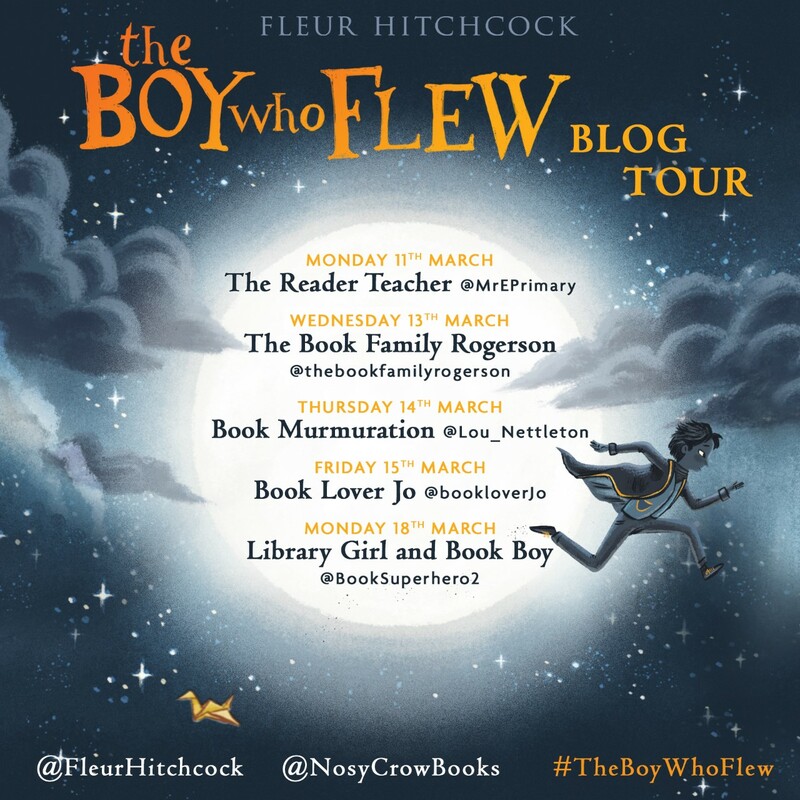 ‘The Boy Who Flew,’ may seem like a departure after Fleur Hitchcock’s contemporary crime novels, which have ‘cornered the market in hard-boiled crime novels for beginners,’ according to The Times. For me this is still quintessentially a Fleur Hitchcock novel, we still have all the core elements that make her stories so compelling. We have a plucky child -Athan Wilde – who finds himself in an impossibly dangerous situation. We have an unexplained murder – Athan’s friend Mr Chen, whose death may be linked to the flying machine that he has been working on in top-secret. And we have a whole host of grown-ups who cause chaos and confusion by being (as grown-ups are want to be) being generally erratic and suspicious in their behaviour. The difference with, ‘The Boy Who Flew,’ is the setting which feels like a character in it’s own right and dominates the novel. Athan lives a poor life, filled with grime and misery awaiting around the corner. The death of Mr Chen seems to have consigned him to a career working in the sewers, which for a bright and inquisitive boy like Athan really is a crime. The story is packed with drama and tension from the offset as Athan tries to protect Mr Chen’s flying machine from falling into the wrong hands but little does he realise that by doing this he is endangering those he loves. We are taken on a breath-taking journey across the rooftops of Bath and experience a dark and uninviting side, a world away from the fashionable spas and glamorous parties of the upper classes. Fleur’s writing stimulates all of your senses allowing the reader to fully immerse themselves in this dirty, sullied backstreets. Yet Athan dreams of a different life, the one that Mr Chen has given him a glimpse of, as he helped him understand that he has the potential to escape the confines of his birth. He refuses to give in to the demands of the dastardly villains who torment and threaten his family, despite being tested to his very limits. He is an intriguing and genuinely likeable character, you can’t help but admire his bravery and ambition. Fast-paced and thrilling, this truly is a edge-of-your-seat adventure, full of twists and turns that will keep you holding your breath to the very last page. 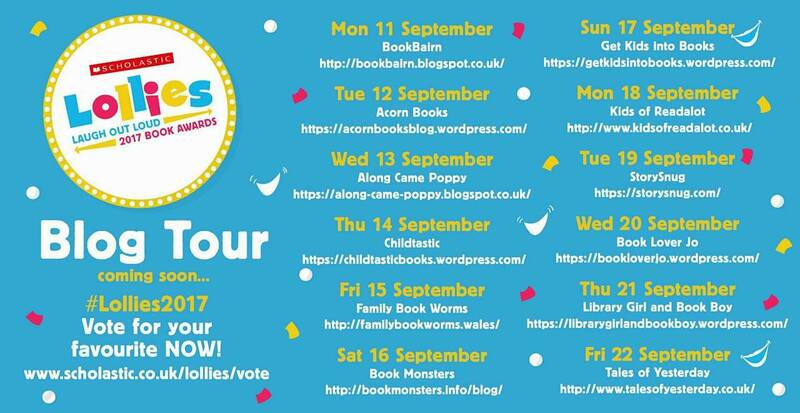 Why not join in with the rest of the blog tour? Thank you to Rebecca and Nosy Crow for inviting me to join in with the blog tour and for sending me a gifted copy of the book in exchange for an honest review. 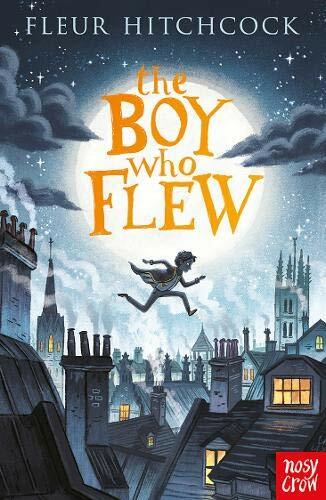 ‘The Boy Who Flew,’ is available to buy now online or from any good bookshop. This entry was posted in Uncategorized on March 15, 2019 by bookloverjo. 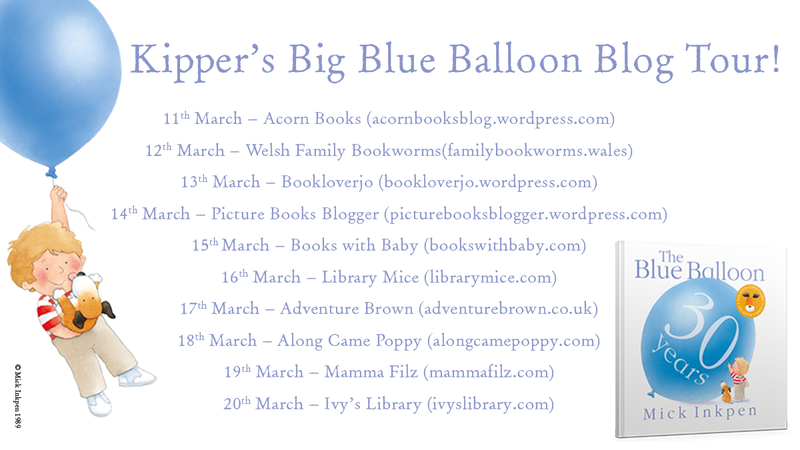 Today it’s my stop on the Kipper’s Big Blue Balloon blog tour to celebrate the 30th anniversary of this picture book classic. ‘The Blue Balloon,’ was released just as I started my first foray into the library world working as a volunteer at my local library as part of a Duke of Edinburgh scheme. 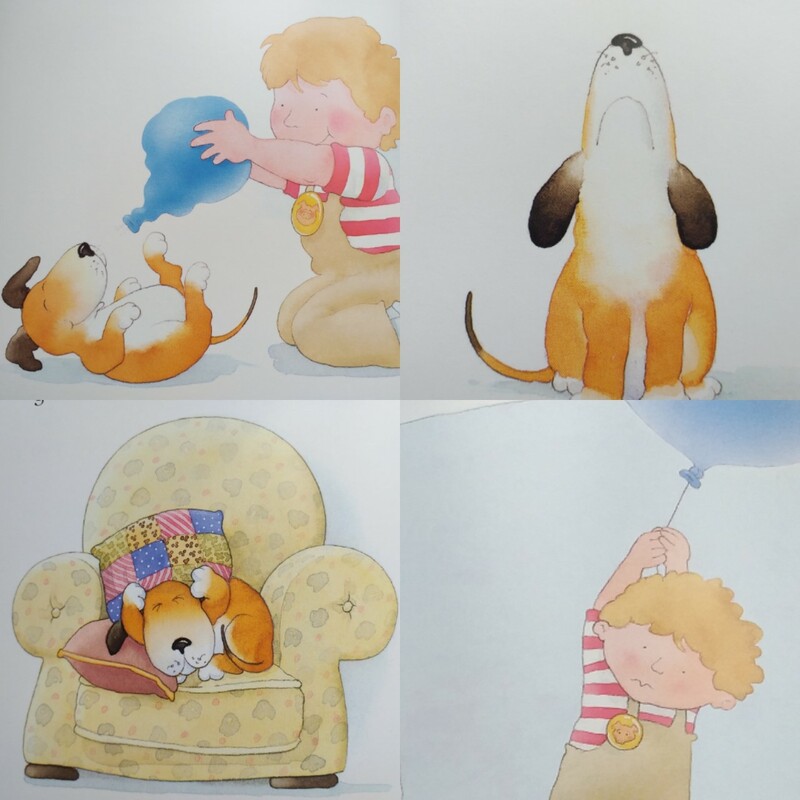 I still remember casting my eyes on the original book and becoming completely enchanted by the loveable puppy Kipper. When my girls were growing up, the Kipper books were a firm favourite in our bookshelf collection. So it has been so joyous to delve back into Kipper’s world in this special edition. 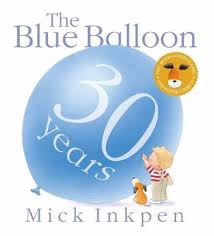 When Kipper finds a soggy blue balloon in the garden, it seems just like an ordinary balloon at first. But it’s not. It has magical powers so no matter how much you blow it, it never pops, it can turn square and take you on adventures to new and wonderful places. This book is a real celebration of the power of play and using your imagination to take you to worlds where there are no limits. I love the fantastic fold-out pages these really captivate children when you are reading this story aloud as they gasp at the size and shapes that this magic balloon makes. The beautiful illustrations with the use of a soft, muted palette makes this book endlessly appealing for children. It’s an absolute delight for younger readers that can be shared over and over again. What fun to be back in Kipper’s world again! 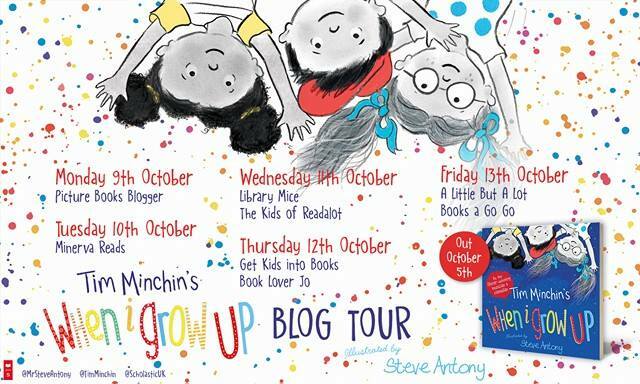 Why not join in with the rest of the blog tour for more reviews and Kipper fun! Thank you to Lucy and Hodder for inviting me to join in with the blog tour and for sending me a gifted copy of this gorgeous book in exchange for an hones review. This special 30th Anniversary edition is available to buy now online or from any good bookshop. This entry was posted in Uncategorized on March 13, 2019 by bookloverjo. 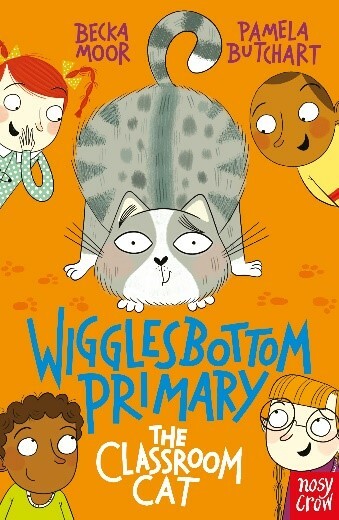 I’m really excited to be able to reveal for you today, the cover of the wonderfully talented Pamela Butchart and Becka Moor’s fifth book in the ‘’Wigglesbottom Primary,’ adventures, ‘The Classroom Cat.’ This hilarious series has brought so much joy to so many children at my school and has had a real success in encouraging a love of reading in newly confident readers. With each new book there is an air of excitement over who will be the first to get their hands on the copy, so it’s so fab to share this with you today. Becka Moor has created another brilliantly, engaging and funny cover combined with Elisabetta Barbazza’s eye-catching cover design, it’s a real joy to behold. If you pop over to my Twitter account you can see the amazing cover reveal animation that Nosy Crow have created. We know that Class 2R are always getting caught up in hilarious antics so let’s find out what they have in store for us in this latest brilliant trio of stories. The big, stripy Classroom Cat first appeared on a Monday, lured perhaps by the stinky smell of fish which was on the menu for school dinners that day. He snuck into the classroom and typed a strange message on Miss Riley’s keyboard before being shooed away. But what could the message mean? Was it a warning not to eat the fish for school dinners? Was the cat trying to save their lives as he gobbled up all the fish himself? When Bobby Henderson dropped his last crisp in the puddle at breaktime everyone chanted at him to eat it. So he did. But then the year 6s came over and said he’d get Puddle-Pox which is even worse than the plague. The school nurse said it was nonsense but how come he had red spots on his arm and was feeling hot? Was the only cure really to roll around in puddle water? Pamela Butchart grew up in a house full of pets with a mum and dad who she was convinced were bonkers. As a student, Pamela’s jobs included being a fishwife, teaching basketball in America and working as a phlebotomist. She’s currently busy juggling writing more hilarious stories with spending time with her son Albie whilst she takes a break from teaching philosophy to teenagers in Dundee. Pamela has two cats called Bear and Carlos. 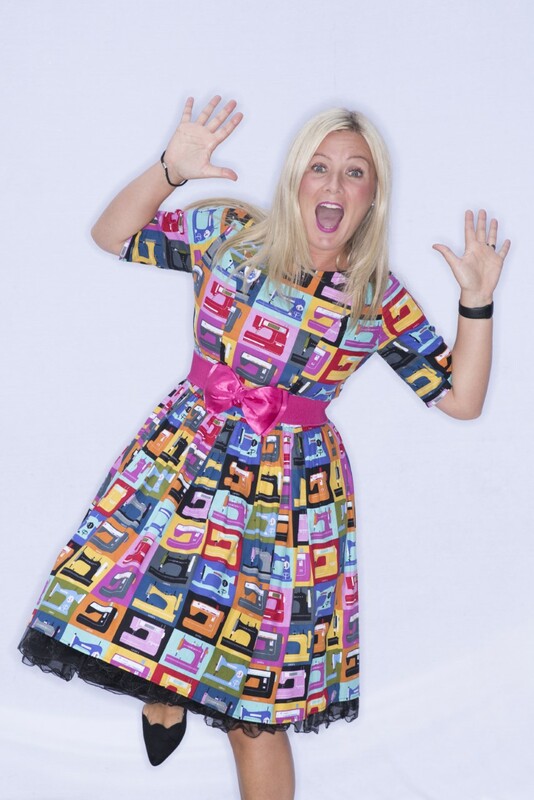 You’ll find Pamela on twitter @Pamela_Butchart. Pamela’s books have won the Blue Peter Book Award (for The Spy Who Loved School Dinners illustrated by Thomas Flintham), the FCBG Children’s Book Award and been shortlisted for the Lollies. Becka Moor is a children’s book illustrator and storyteller living in Manchester. She rents desk space in a stunning grade II listed building with other creative folk, has an obsession with cats and loves anything a bit on the quirky side. 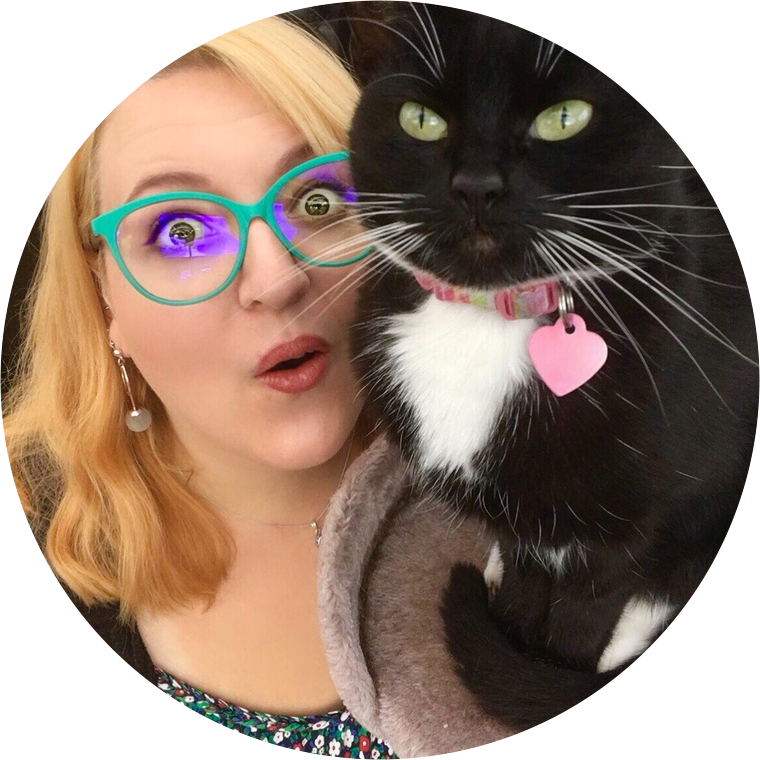 She tweets at @BeckaMoor under the strict supervision of her cats Miss Daisy and Bella, aka Ray-Ray and Miss Cinderbella. Thank you to Clare and Nosy Crow for inviting me to host the cover reveal. ‘The Classroom Cat,’ is released on the 4th July and is available to pre-order online or from any good bookshop. This entry was posted in Uncategorized on March 12, 2019 by bookloverjo. Regular readers of the blog will know I’m a huge fan of illustrated fiction books. They are perfect for newly confident readers allowing them to gain confidence without being overwhelmed by pages of text. Here is my round up of my favourite recent releases all guaranteed to enthral and entertain younger readers. They would make wonderful additions to any primary school library. The Nothing to See Here Hotel has opened its doors for another fabulously funny adventure that is guaranteed to make you laugh-out-loud and rack your brains when it appears something fishy is going on! This series stands out from the crowd with it’s original storytelling, madcap mayhem and wonderfully wacky characters. 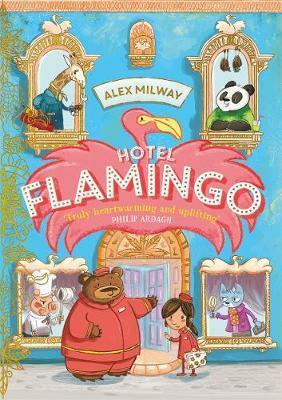 As Frankie and his family are preparing to celebrate Grandad Abraham’s 175th birthday they make an unlikely discovery that reveals an underwater wing of the hotel that’s been hidden away for years. It sounds like the perfect excuse for a truly spectacular party. But lurking in the shadows are secrets and sea monsters, can Frankie uncover the truth before it’s too late. 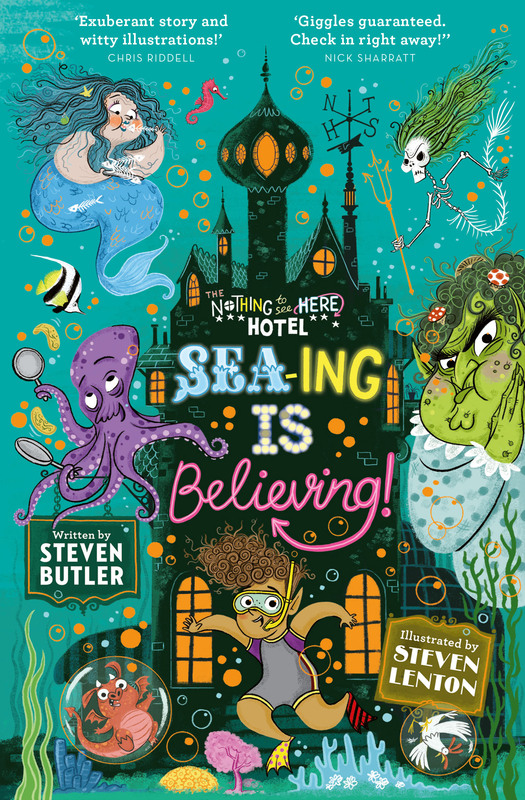 Steven’s Butler’s brilliantly bonkers tale is captured magnificently by Steven Lenton’s with witty and extraordinary illustrations featuring the most dark and delightful details. Entertaining and endearing I can’t wait to return for another stay at this monstrously magic hotel. 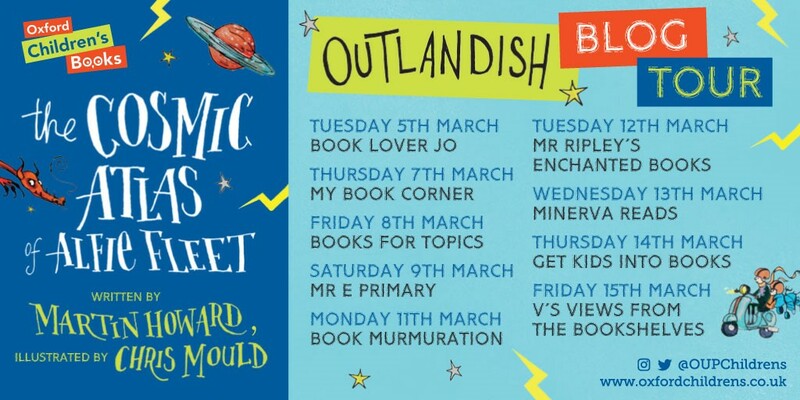 As an avid reader of ‘Secret Seven,’ when I was growing up I was thrilled to see that the series was coming back especially as it was going to be in the very safe hands of the fabulous Pamela Butchart. Maintaining all of the charm and fun of the original series, Secret Seven is brought bang up to date in this second exciting new mystery from Pamela. 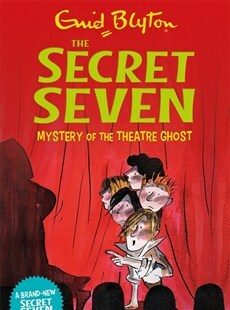 When a local theatre company goes to town, the Secret Seven are excited when they are chosen to help out. But when a series of unexplained incidents occur there is talk from the cast of a theatre ghost being responsible. Not convinced by this explanation the gang decide to delve deeper behind the scenes to help uncover the true culprit. Packed with secret doors, spooky clues, lots of red herrings and mystery aplenty this new adventure is bound to delight and excite younger readers. Jasper is the smartest kitty on the block. But despite his very fancy apartment, stacks of books and beautiful bow ties he feels like his life is missing the right type of friends. Convinced the gap in his life can be solved by becoming a member of ‘The Sophisticats,’ he invites them round for dinner. A chance meeting with an abandoned, boisterous puppy Scruff derails his plans and his best efforts are not even anywhere good enough. Jasper soon discovers that friendship can happen in the most unlikely and unexpected ways. 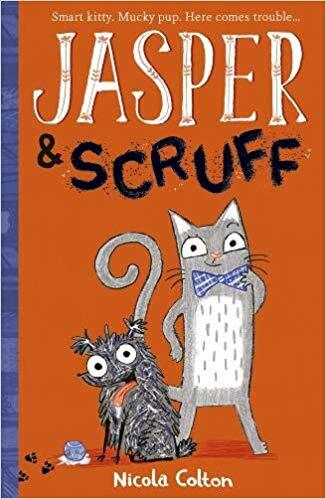 Bursting with hilarious and perfectly stylish illustrations, I was utterly charmed by ‘Jasper and Scruff.’ Laugh-out-loud moments and a heart-warming story make for a wonderfully charming tale. When Ellie is abandoned once again by her father she is furious. Left with her dumpy and frumpy grandma she decides to exact her revenge by being rude and spoilt, throwing her dinner on the floor and refusing to do as she is told. But little does she know that her grandma has magic tucked away up her sleeve and her outburst results in her swapping bodies with Jolly the Cat. Can Ellie prove that she can change her ways and complete the challenge she has been set? Or will she spend the rest of her days trapped in Jolly’s body! Malorie has created a highly entertaining story filled with magic and mischief that is bound to make you chuckle. Matt’s illustrations cleverly capture the chaos unfolding as Ellie strives to overcome all the obstacles put in front of her, in her race against time. Hilarious and heart-felt in equal measures this a truly delightful story. 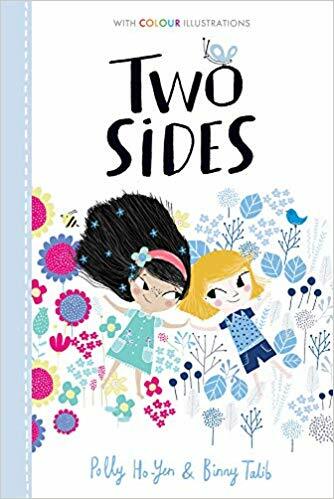 ‘Two Sides,’ is one of the first books in a new series of beautifully illustrated full-colour fiction range from Stripes Publishing. 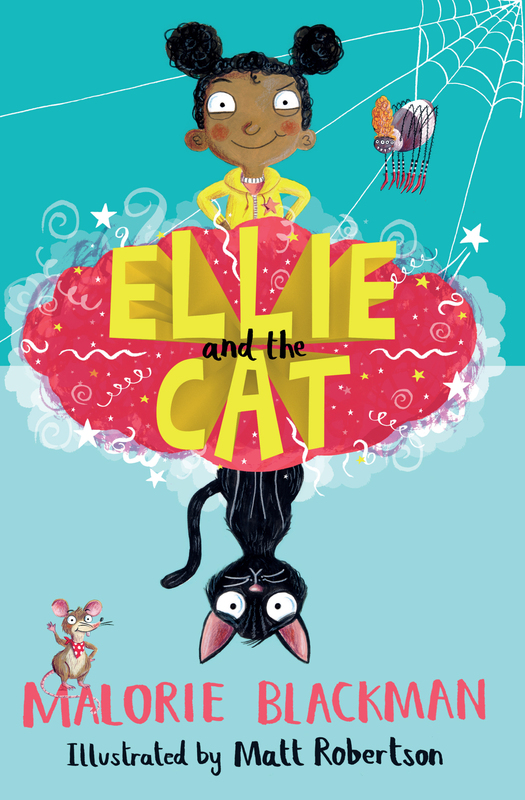 It tells the story of Lula and Lenka who are the best of friends but opposites in every way. Lula is always late, while Lenka is always on time. Lenka likes to chat but Lula prefers to watch people. Yet they’re still the happiest together. Until the day when it all goes horribly wrong and the have an enormous fall out and neither of them will apologise. Life isn’t the same without each other and they both get sad and lonely. Will they never be friends again? Cleverly told, this thoughtful story explores the impact of discord in a friendship by showing that there is indeed always two sides to every story. It encourages children to understand how their behaviour can impact on others. Exquisitely produced with stunning illustrations that highlight the emotions of both girls perfectly. Thank you to Barrington Stoke, Hodder, Piccadilly Press, Stripes Publishing and Simon & Schuster for sending me gifted copies of these books in exchange for an honest review. You can buy or pre-order all of these fab books online (click title for the link) or from any good bookshop. This entry was posted in Uncategorized on March 10, 2019 by bookloverjo. 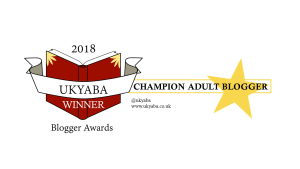 Today I am delighted to welcome Liz Kessler to the blog with a special guest post on her writing inspiration to celebrate the release of the eighth adventure in the ‘Emily Windsnap’ series. 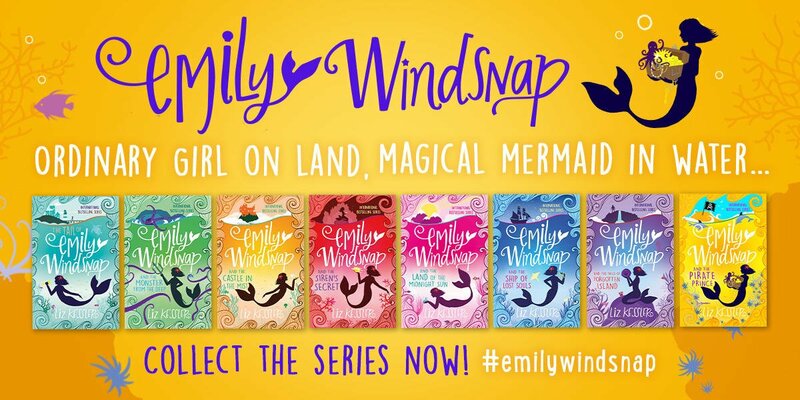 ‘Emily Windsnap and the Pirate Prince,’ features a transformative moment for our young heroine. Emily begins to recognise the importance of becoming self-reliant and staying true to herself. So when pirates kidnap her friends she realises it’s within her power to save the day. Liz lives in the beautiful St.Ives in Cornwall which just happens to be my most favourite place in the world, so I was interested to hear how she was inspired by these stunning surroundings. I’ve got writer friends whose children say such funny and original things that I’ve often thought it gives them a head start when it comes to writing books. In fact, one friend, Keris Stainton, has SUCH a head start that she actually made a whole book out of things her sons had said. But when it comes to being inspired by your surroundings, I have to hold my hands up and admit that, yeah, maybe I have a bit of a head start too. 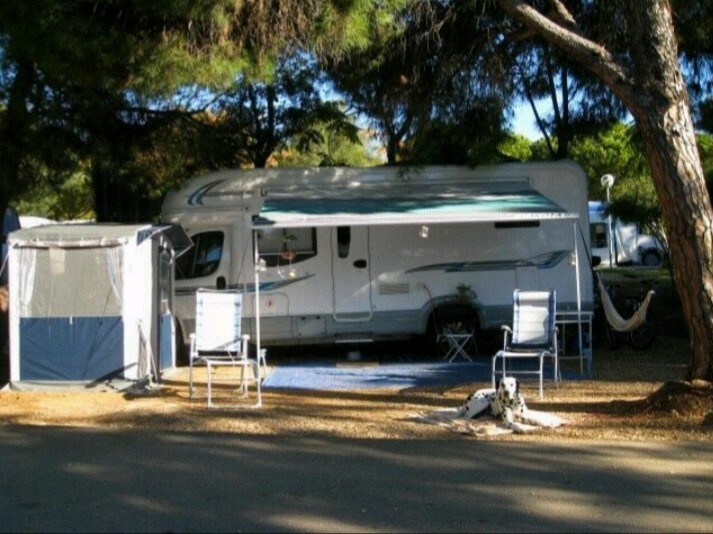 Ten years ago, my partner and I rented out our house, packed up a few belongings, got the dog a pet passport and set off for a year in a campervan. It was an incredible year of adventuring, exploring and getting inspiration. Here’s the van, the dog and a temporary office I set up on a long term pitch in Spain. 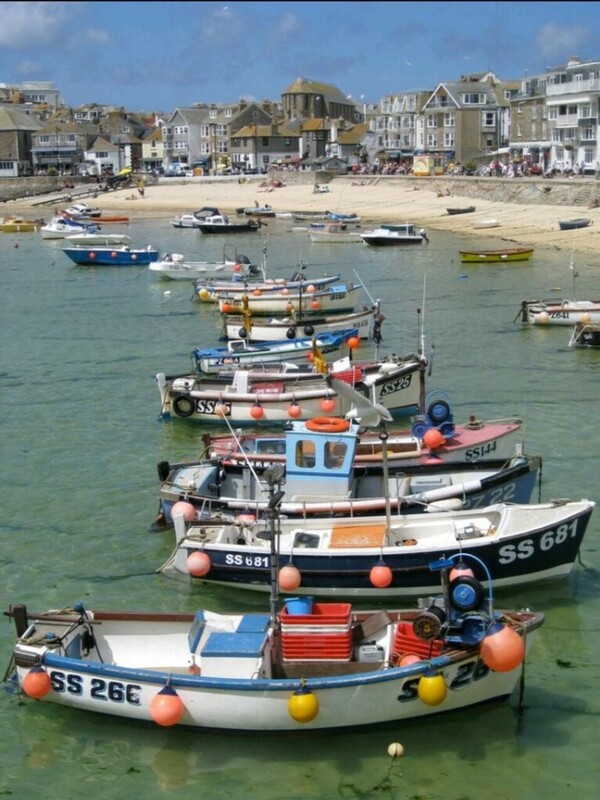 We eventually found ourselves in St Ives, and by the end of an afternoon on the beach and an evening in the harbourside pub The Sloop, we had fallen in love with the place and decided to live there. I genuinely pinch myself every day – not only because I love it here, but also because it is so perfect for me and my books. I’ve always adored the sea, I’ve always loved messing about on boats, and for over fifteen years I’ve written books about a part-time mermaid. I could not imagine living anywhere better. 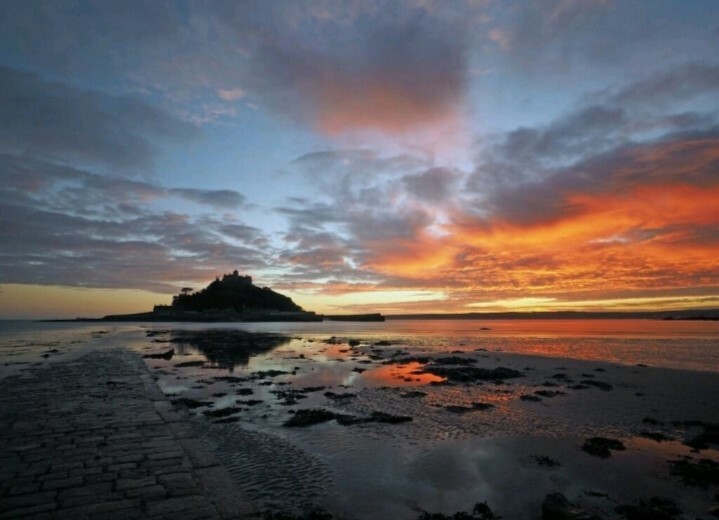 The funny thing is, years ago, a friend told me about a magical place in Cornwall, where there’s a castle on a hill on a tiny island that is sometimes connected to land and sometimes cut off from it depending on where the tide is. The place was called St Michael’s Mount. I was instantly enthralled and, shortly afterwards, set off to spend a week in a hotel overlooking the castle as I researched what was to become my third book, Emily Windsnap and the Castle in the Mist. I now live twenty minutes’ drive from this magical place. See why I have to pinch myself? If you have never been here, take it from me: Cornwall is beautiful! In fact, I’m writing this blog with the sound of seagulls outside my window while white, curling waves crash onto the beach. When I am struggling with a plot problem, I have learned that one of the best ways to figure it out is to go for a walk. I actually think that walking anywhere is helpful for this. The act of walking itself seems to help the problems wriggle free and untie themselves. Walking around here has added benefits. 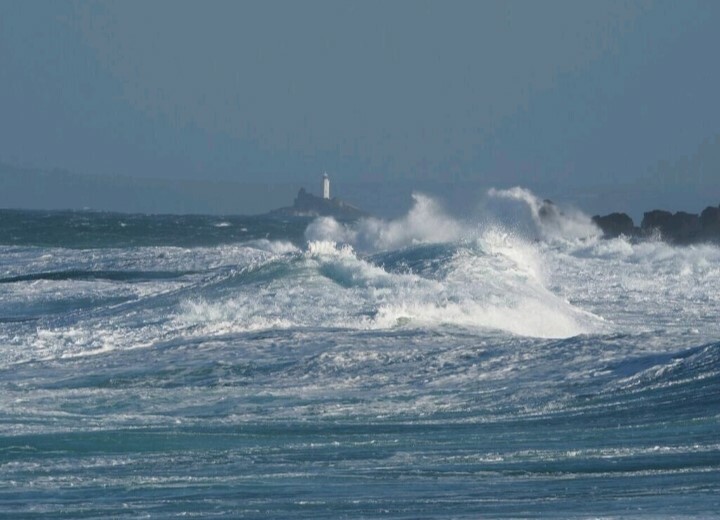 For example, I was once walking along the coast path from Carbis Bay to St Ives. I’d walked along this route many times with our dog and knew it well. This time, I must have taken a different turning without realising, as I found myself on a tiny offshoot from the normal path. Out of nowhere, I came across this. Like. Literally. Walking along the coast path. 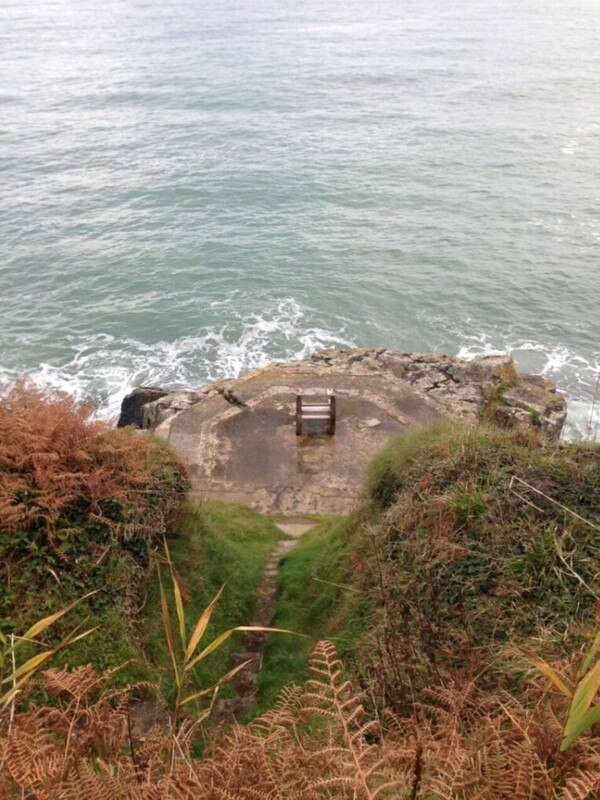 Ocean spreading out forever on my right – and suddenly there is a great big, wooden chair on a plinth. Well, of course that went in a book! The chair became a crucial part of the setting of Emily Windsnap’s sixth adventure, The Ship of Lost Souls. Other times, I find that I am simply inspired by the beauty and majesty of nature. Like this. An iphone pic from a recent walk. 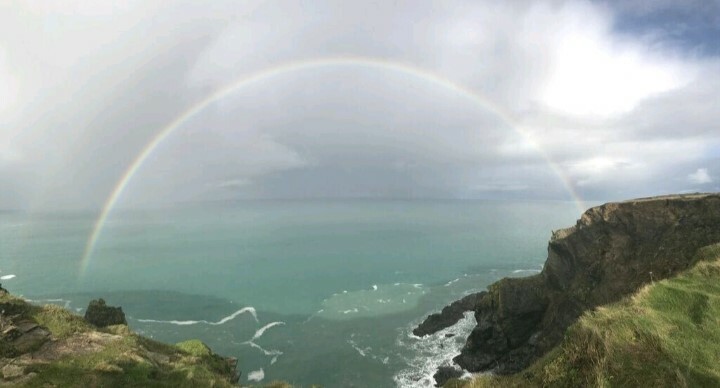 This rainbow didn’t specifically find its way into a book – although it still may do some day – but it filled me with inspiration and wonder at how nature manages to be so incredibly beautiful. 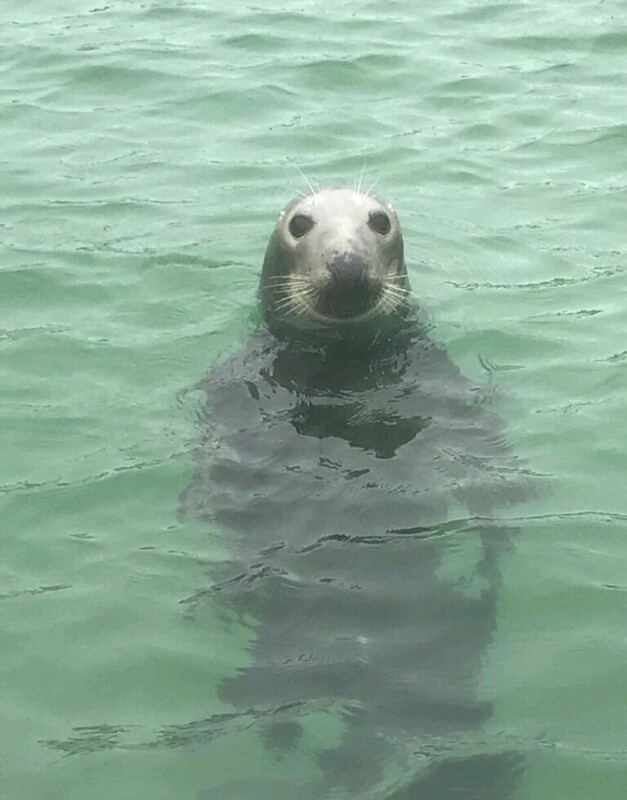 And while we’re on nature, summer in St Ives would not be summer without our gorgeous visitors to the harbour. The mermaid dogs more commonly known as seals. 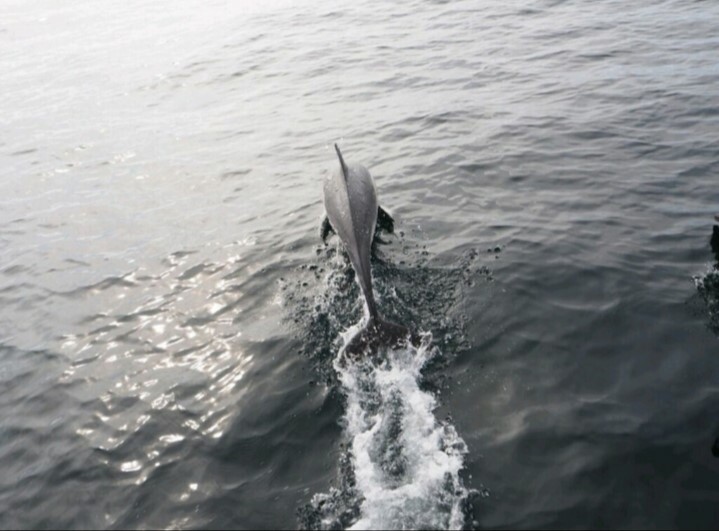 Even more special, as it is a little bit more rare, is when we see dolphins. We have a little fishing boat, and I also go rowing with the Pilot Gig Club three times a week, so we have lots of opportunities to spot the local sea life. We’ve even seen basking sharks and a Minke whale! One thing I’ve never seen whilst looking out to sea is pirates. In real life I’m pretty glad about this! But when I started thinking about my new book, Emily Windsnap and the Pirate Prince, it did mean I had to look further afield for inspiration. 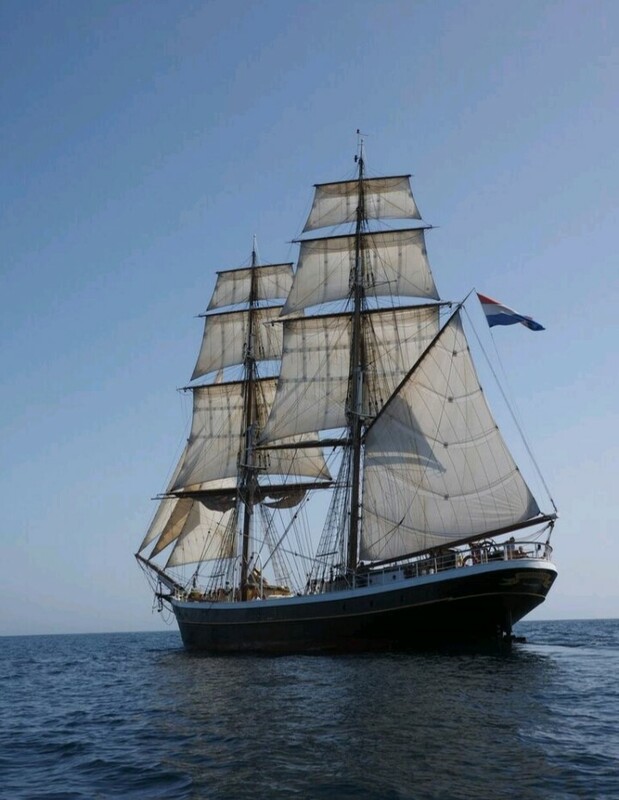 It also meant I had an excuse to do something I’d wanted to do for years…go on a trip on a tall ship. 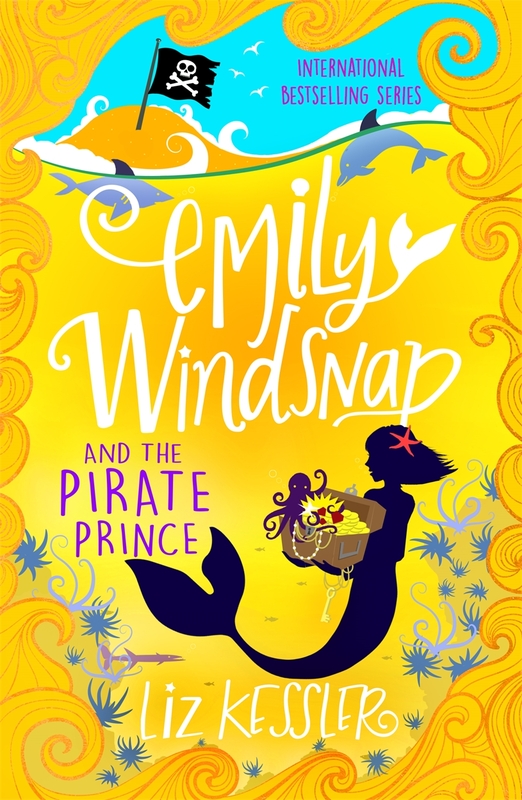 Emily Windsnap and the Pirate Prince is just out and I hope that lots of young readers will take the book on their summer holidays and sit reading it on a beach. And secretly I hope that it will inspire them to stop reading every now and then, look out to sea and let their own imaginations run free about the beautiful creatures and the mysteries and secrets that might, just might, be out there. 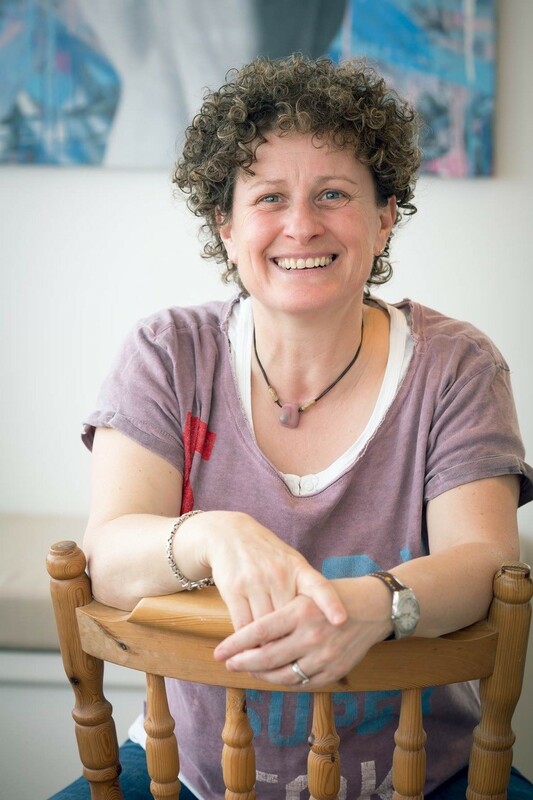 Liz Kessler studied English at Loughborough University, has worked as a teacher and a journalist and has an MA in Creative Writing from Manchester Metropolitan University. After taking a year off to travel around Europe in a camper van, Liz now lives in Cornwall. You can find out more about Liz by visiting her website, follow her on Twitter and on Facebook. Thanks to Liz for this really insightful guest post. ‘Emily Windsnap and the Pirate Prince,’ is available to buy online now or from any good bookshop. Why not collect the rest of Emily’s adventures too? 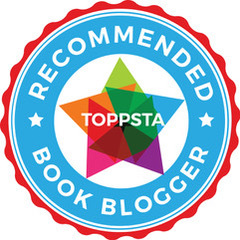 Thanks to Nina Douglas for inviting me to host this guest post and to Hachette for sending me a gifted copy of the book in exchange for this post. This entry was posted in Uncategorized on March 8, 2019 by bookloverjo. There’s always a certain amount of sadness when a series you love comes to an end. 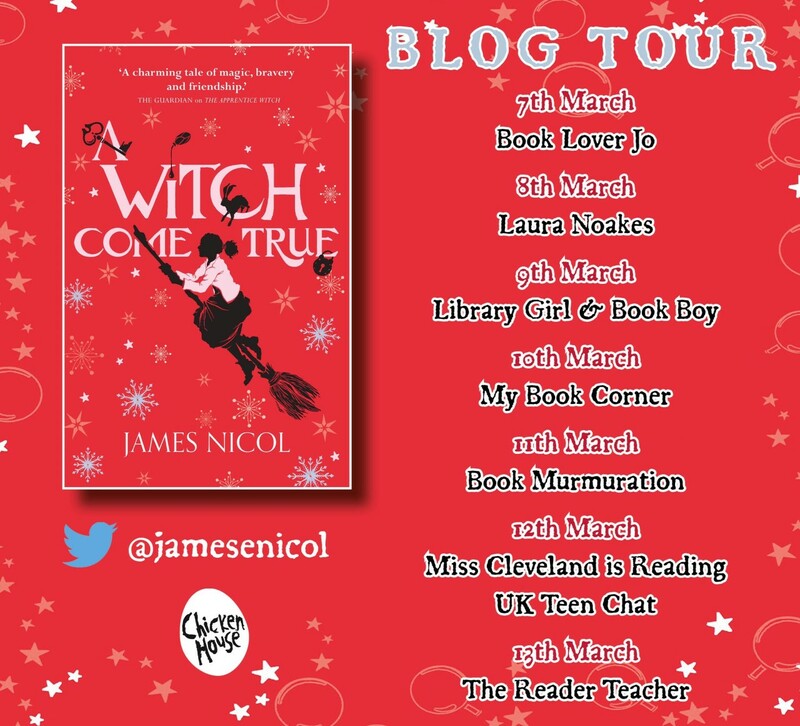 I can’t believe the wonderful Apprentice Witch has now reached the final book in the trilogy, ‘A Witch Come True.’ James Nicol’s wonderful writing has completely cast a spell over me and enjoyed getting lost in Arianwyn’s world. Now that the war is done Arianwyn is hoping that her life can return to normal and she can learn the truth of the quiet glyphs at last. Unfortunately her troubles are far from over, the hex on the great woods is a heavy presence in her mind and her day-to-day work in Lull is constantly testing her knowledge. But the darkness is rising once again and Arianwyn’s self belief is wavering. A dramatic turn of events pushes her to her very limits as she searches for a way to protect those she loves the most. James brings this series to a rather fitting and glorious end with a story filled with darkness and magic spilling out of every page. Arianwyn’s struggles to come to terms with the changes all around her, everyone seems to have moved on apart from her and she feel the weight of the responsibilities set upon her which never allow her to be herself. Despite her success she still doubts herself and this is compounded by the words of those around her who seek to control her every move. But inside Arianwyn know she must choose to make her own decisions even when they go badly wrong. She’s incredibly brave but flawed and this is why she totally stole my heart from the very first story. Surrounding her with such a brilliant cast of characters brings this story to life allowing the reader to become totally absorbed in this marvellous adventure. There is so much magic and beauty within this book, James has totally brought this series to life with his extraordinary world-building which continues to enchant me. I feel like I’ve entered the gates of Lull and been able to watch the events unfold right before my eyes because James’s writing is so thoughtful and descriptive. For me this series has really stood out for being exceptionally written, James has a real talent for storytelling that I really admire. Ultimately this is a story of bravery, friendship and having belief in yourself when others may doubt you. A truly unforgettable story filled with magic and mystery that will capture your heart and captivate your imagination. If you’re intrigued by this review you can read the first chapter here. Thank you to James for inviting me to join in with this blog tour and to Chicken House books for sending me a gifted copy of this book in exchange for an honest review. 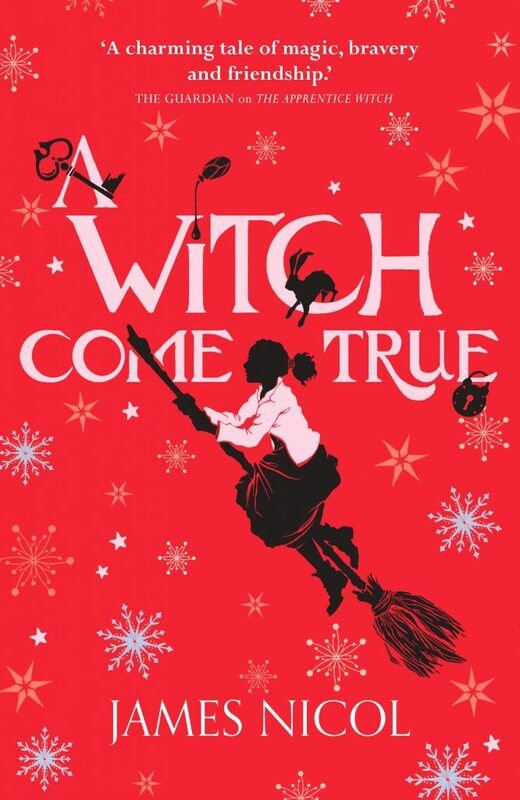 ‘A Witch Come True,’ is available to buy now online and from any good bookshop. An irresistible combination of glorious characterisation and completely believable world building makes these stories utterly compelling. This entry was posted in Uncategorized on March 7, 2019 by bookloverjo. 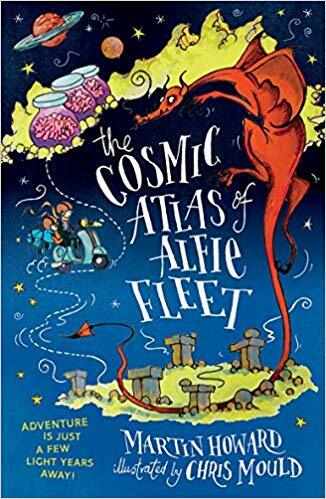 Today I’m kicking off the blog tour for Martin’s Howard’s intrepid adventure, ‘The Cosmic Atlas of Alfie Fleet,’ illustrated by the brilliant Chris Mould. Alfie lives a bleak and depressing life. He and his mum are desperately poor and live on a diet of fish-head soup, you know it’s bad when homeless people slip you a few coins because they feel sorry for you. But Alfie is determined to bring a bit of a joy into his mum’s life on his birthday and will do anything to earn some money. So when he sees an advert offering him a chance to earn £49.99 for a day’s work he is compelled to respond. Little does he know that his new job for The Unusual Cartography Club is about to take him on a mind-bending, out-of-this world adventure that he will never forgot. A journey that will take him via Brains-In-Jars world to Outlandish where he will have to learn to outwit barbarians and slay dragons if he’s ever going to find his way back home in time for his mum’s birthday. Wonderfully eccentric and downright peculiar in every way I can see this book being devoured by children at school. I particularly enjoyed Alfie’s creation of a humorous travel journal where he records all his thoughts as he experiences all these weird and wonderful events. Martin has assembled an intriguing cast of characters from the quirky professor to the vain Prince Hoodwink. He challenges stereotypes by making the brave knight Sir Brenda who takes on quests, while her husband stays at home looking after the children and the savage Derek who is a ferocious beast who despite the name is also a girl. Chris Mould’s intricate and lively illustrations give the reader a real sense of the strangeness of the situation Alfie finds himself in. His skill for capturing the personalities of characters is just marvellous, his illustrations are completely engaging. Fabulously funny and brilliantly bonkers, this is a really entertaining read. 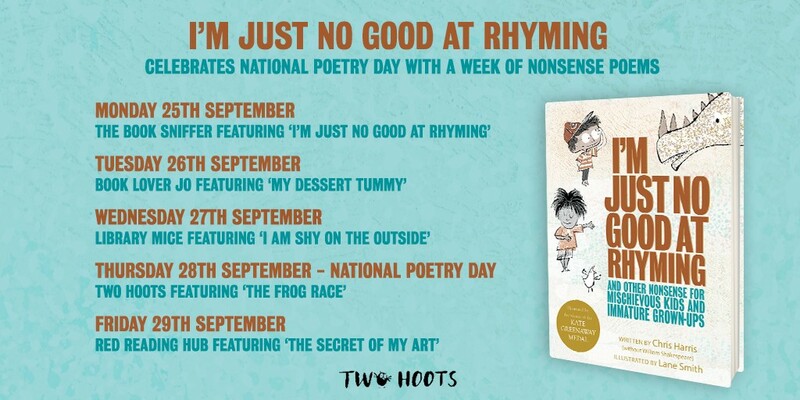 Why not join in with the rest of the blog tour to find out more about this funny adventure. Thank you to Emma and OUP for inviting me to join in with the blog tour and for my gifted copy in exchange for an honest review. ‘The Cosmic Atlas of Alfie Fleet,’ is released on the 7th March and is available to pre-order now online or from any good bookshop. This entry was posted in Uncategorized on March 5, 2019 by bookloverjo.